Yesterday I took a drive up north to the Terrick Terrick National Park. I have previously activated this park, at the start of the KRMNPA activation weekend in 2012. The activation yesterday was again part of the the Keith Roget Memorial National Parks award and the World Wide Flora and Fauna, WWFF, Award. Last time I was here I made 5 QSOs and I was determined this time to make at least 39 QSOs to make 44 total to qualify for the global WWFF award. 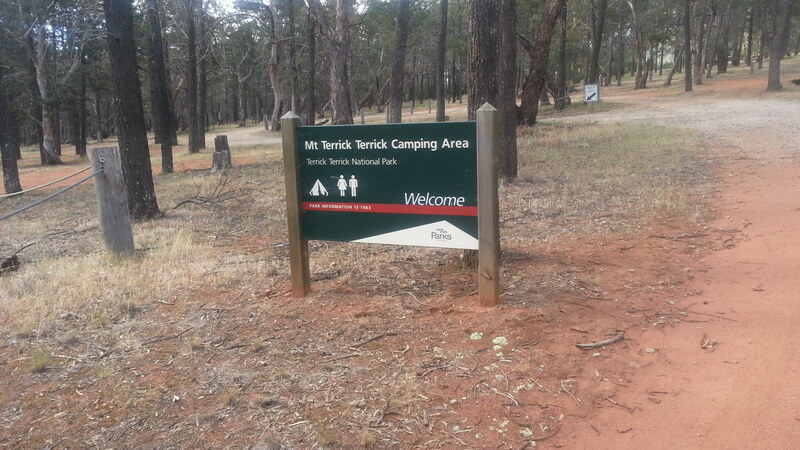 Arriving around midday at the Mt Terrick Terrick camping ground, I set my linked dipole antenna as an inverted vee, with the apex about 12 metres up a tree. I was on air just before 1:00 pm local time and started out on 40 m with a few local stations around VK3 and VK5. Switching to 10 m saw QSOs from Taiwan, Asiatic Russia and Japan followed New Zealand stations on 15 and 20 metres. Returning to 40 m saw more VK stations in my log and after 4 hours I had 31 QSOs in the log. At 16:45 local I moved back to 20 metres and put out a couple of CQ WWFF calls on 14.244 MHz and got a report back from HA0LG who then placed a spot on the DX cluster to advise others that a WWFF activation was in progress. This brought a huge pileup of European stations wanting to work me in this National Park. This pile up was bigger than I had experienced at the Little Desert National Park back in March. I shut the station just before 18:00 local with 95 QSOs in the log, 64 coming in the last hour. Being ‘spotted’ sure makes a huge difference. Needless to say I have now qualified this park for the global WWFF award. This entry was posted in Amateur Radio, KRMNPA, Radio awards, WWFF. Bookmark the permalink.